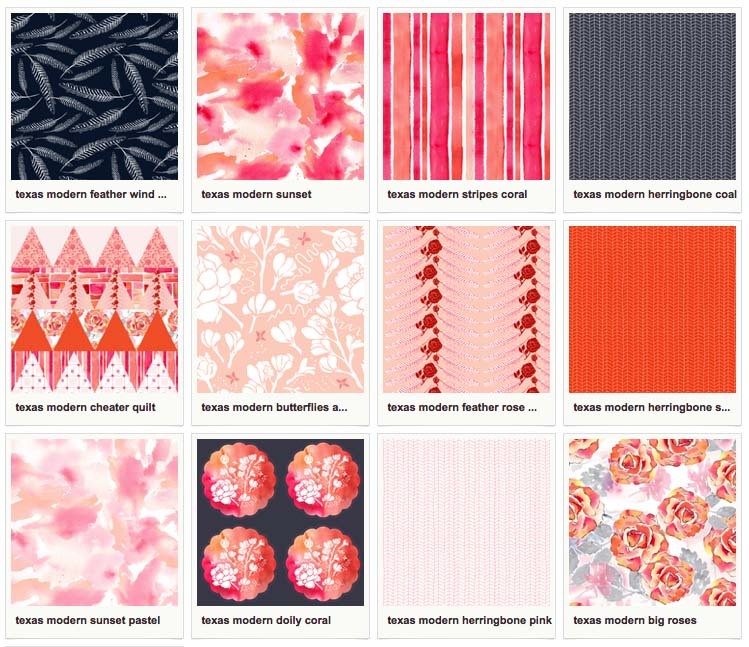 Texas Modern: A Fabric Collection from Prudent Baby! I’ve been stitching away and hanging fabric on fence posts and now I’m finally ready to show off Texas Modern, my first fabric collection. Texas Modern is inspired by all of the beauty I find living in Texas, from glowing sunsets to swooping birds of prey, from farms and fairgrounds to the pageantry of big bows and rose gardens, all with a modern twist. Texas Modern has a southern feel but I hope you like it even if you are from Rhode Island or North Dakota or California. Speaking of California, thanks to Jaime for the dreamy brainstorming sessions that started 9 months ago over a couple of New Ages in Salt Lake City. All of my designs start as original watercolor paintings and ink drawings. I’ve enjoyed getting back to my roots as an artist and have become addicted to creating new designs. And just when I thought I couldn’t love designing patterns any more… I sent them off to Spoonflower and now have my own actual fabric. That is an amazing feeling. 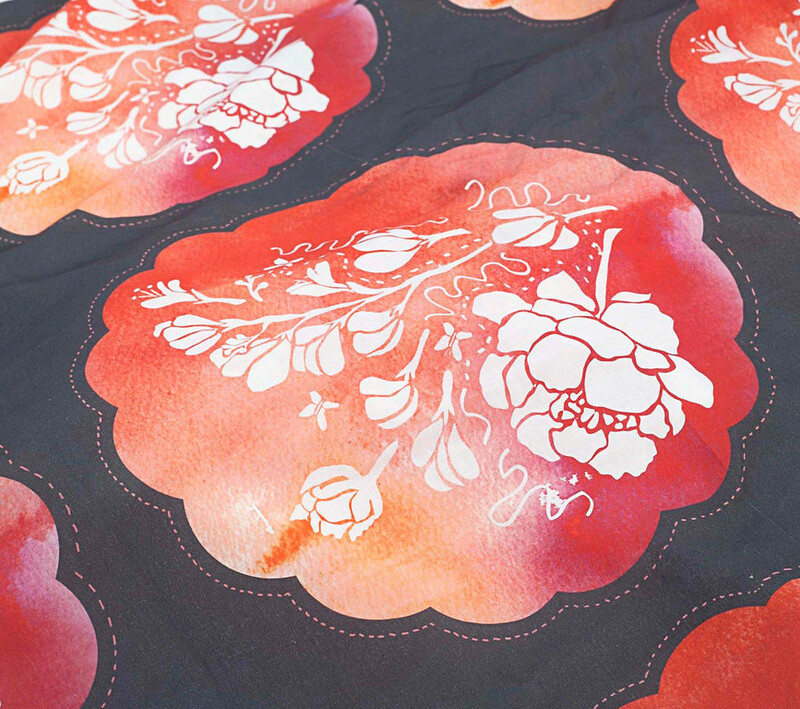 If you like Texas Modern too, you can order some from Spoonflower. 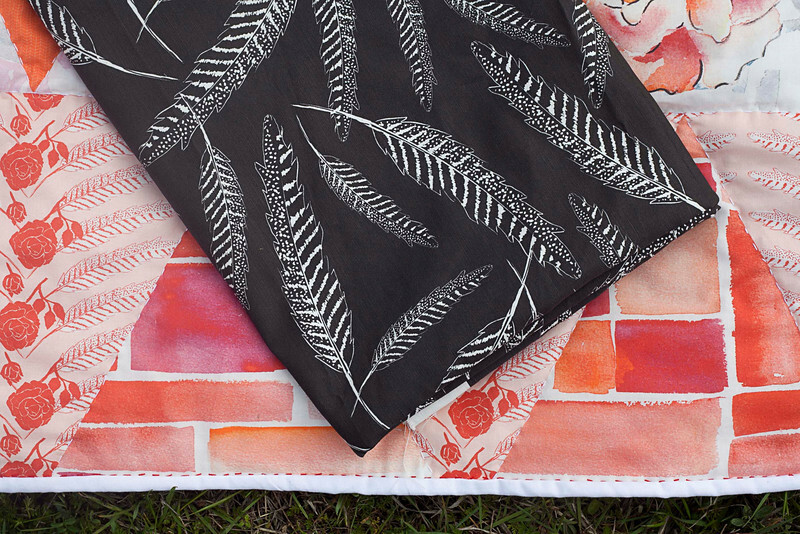 They have everything from a fat-quarter on up in any one of 9 fabric types starting at $11. Ive seen the canvas, cotton silk and quilting cotton in person and they are LOVELY. Now that I’ve stopped rolling around in it giggling, I’m eager to share a bunch of Texas Modern projects with you. I hope that you will share yours too! In fact, I would be forever grateful if you did. What a fun collection (and quilt)! Congrats!!! 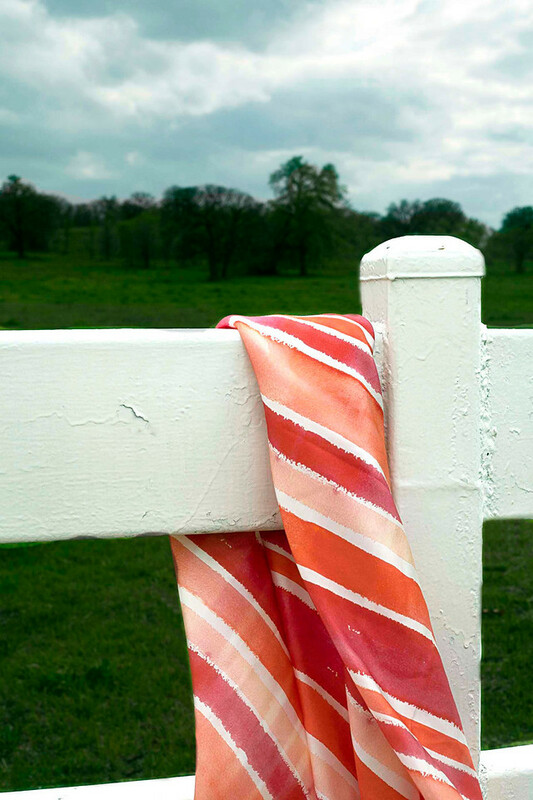 I was just wishing yesterday that there was some nice Texas inspired fabric out there! Absolutely gorgeous, I love the colors! Beautiful…I have lived in Rhode Island for 36 years and YES I LOVE IT! Don’t get me wrong I think these are lovely but where are the blues and greens and browns and other Texas colors? When I think Texas I think bluebonnets and fields of green grasses and cows. Like I said these are lovely but not my cup of tea. Sorry. What a great collection. Well done. I’d love to make a skirt or something from one of the bigger prints. Thanks ladies! Your comments mean so much to me. I’ve been holding my breathe waiting to hear what you think! And yes, Valerie, I have big plans for traditional Texas colors too! So beautiful! 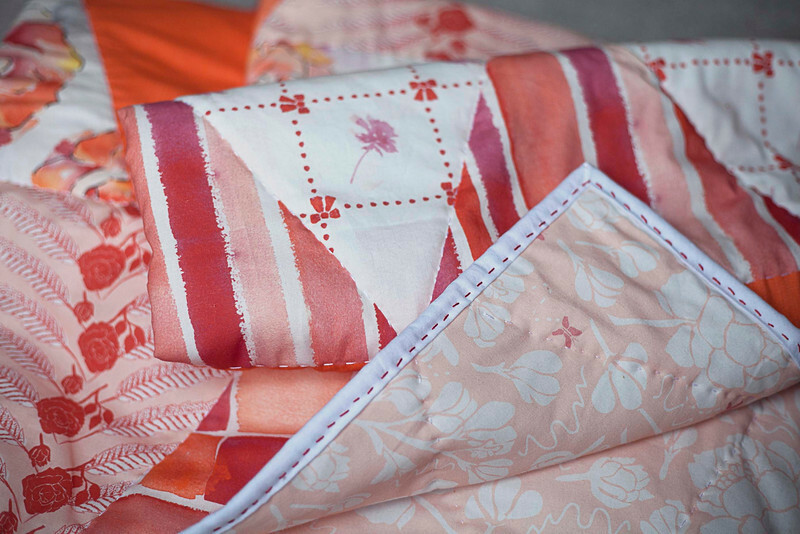 My daughter would LOVE these and I’ve been looking for a cheater quilt I like enough to try ever since your post on cheater quilts… and I love this one! So beautiful. Great work, Jacinda! Those are gorgous patterns. You should be very proud!!! I was born in TX and these make me miss it so much! JC you are too much!! So much talent for one girl. I love that you celebrated all that’s around you – always finding beauty in your surroundings. Gorgeous fabrics – dare I sew a skirt for Griffin. Congratulations!!! I love the cotton voile. My favorite lightweight summer fabric. Three yards of the feather black/white will make two beautiful huge(54×54) scarfs, sarongs, shawls, etc. My fabric should be arriving an a few days, can’t wait! Jacinda, these are just stunning! I am SO happy for you. I am sure they will be a huge success, congratulations!!! I am going to buy the texas wind and texas sunset. I will send you a picture of whatever I whip up with it! Gorgeous! I love the watercolor roses and feathers on black. What an amazing collection! 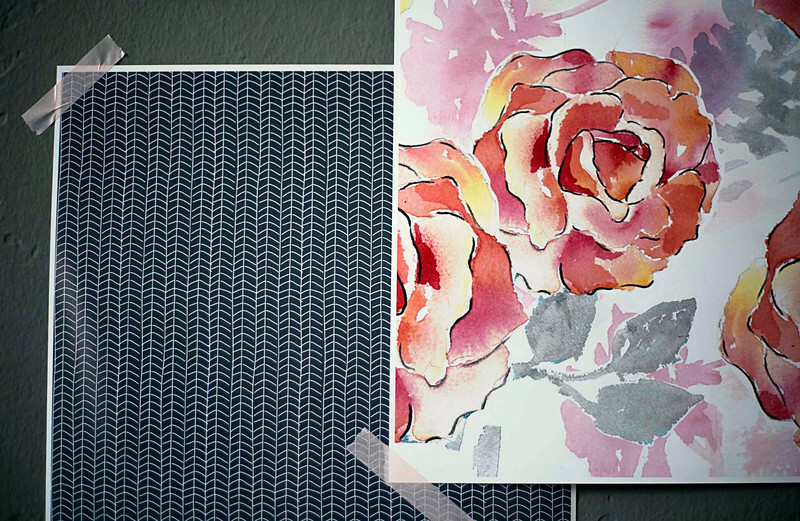 I love the black herringbone, and the watercolour blocks. Texas has a lot to live up to! I love watercolors and live that you did that for your fabric! Beautiful! 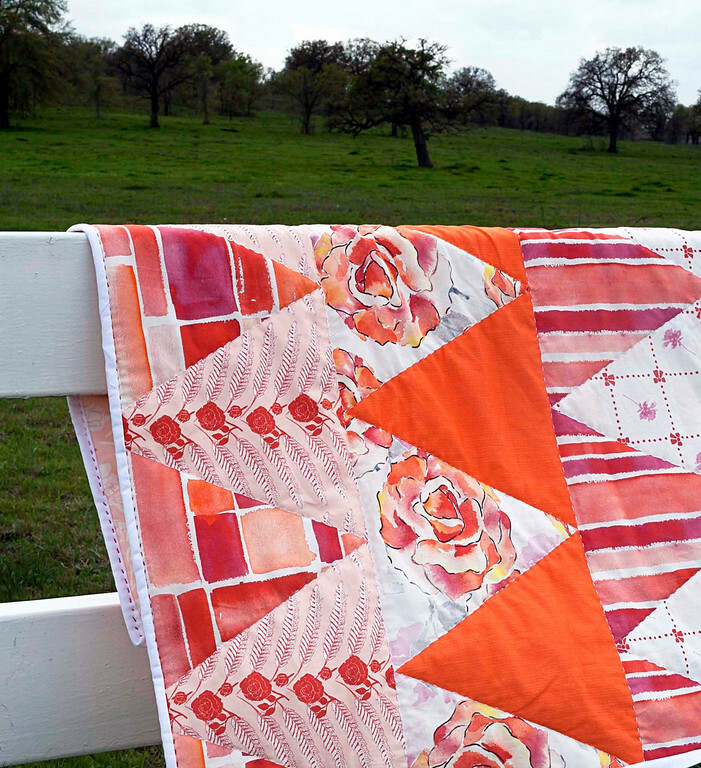 LOVE the cheater quilt fabric! In fact, I couldn’t even tell if it was a cheater quilt or not until I scrolled to the bottom where you show the whole collection. I also love the way the way the binding is stitched! Awesome Job Pretty Lady!!! Its airy, edgy and I LOVE the colors!! Thanks a bunch for sharing. so beautiful!! i especially love all the watercolor prints! Your sweet comments make me all warm and happy! Seaweed & Raine-there are a few designs I want to tweak before putting them up for sale. Coming soon! This fabric collection is just beautiful!! I love your fabric, it’s just beautiful! I just found out about Spoonflower and seeing your fabric line makes me even more excited to design something!! Thank you Judie! Spoonflower is awesome. I notice the cheater quilt is sold in increments of one yard, but for a crib quilt I am thinking I want 42″ by 44″ or so. It looks like I could just buy two yards and cut the quilt top to my desired length (perhaps ideally using the lines in the fabric as a guide) and go from there. There’s no reason that wouldn’t work, right? Just making sure I have my ducks in a row before ordering. Exactly! you would want about 1.5 yards for a square baby quilt so order 2 yards and that will leave you a little extra fabric for a little pillow or curtain tie-backs! I’m so excited, I can’t wait to see it Tristin! Wow! 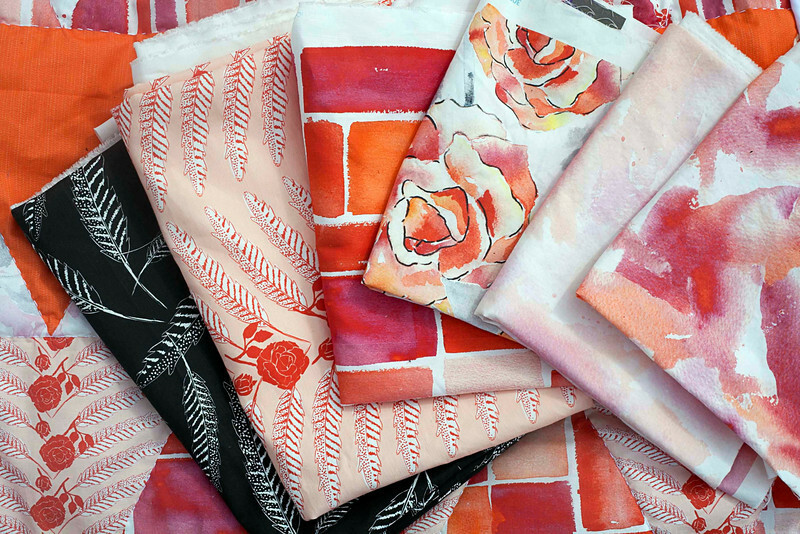 these fabrics are stunning! I love the orange colors!!! !….and being from the south I love the southern flair at well…:)it would be so nice if you could eventually put together some charm packs, jelly rolls, layer cakes, etc….i really do love these colors though…. Love the way this fabric makes me feel. Such sweet colors and your designs are wonderful. Your roots are good ones!! I hope to get some sometime soon.